Computer role-playing games have struggled to capture the intimacy and limitless possibilities of their pen and paper cousins since their conception. For most of these games, they compensated by telling sweeping epics that captured our imagination through the sheer force of their storytelling, rather than rely on the communal experience of diving into an adventure with a group of friends on a Friday evening. But Sword Coast Legends has different aspirations. Instead of focussing on telling a story that can stand tall next to other paragons of the genre, like Baldur’s Gate II, it instead seeks to capture that social element of role-playing, giving players a digital alternative to sitting around a table fussing over character sheets and dice rolls. 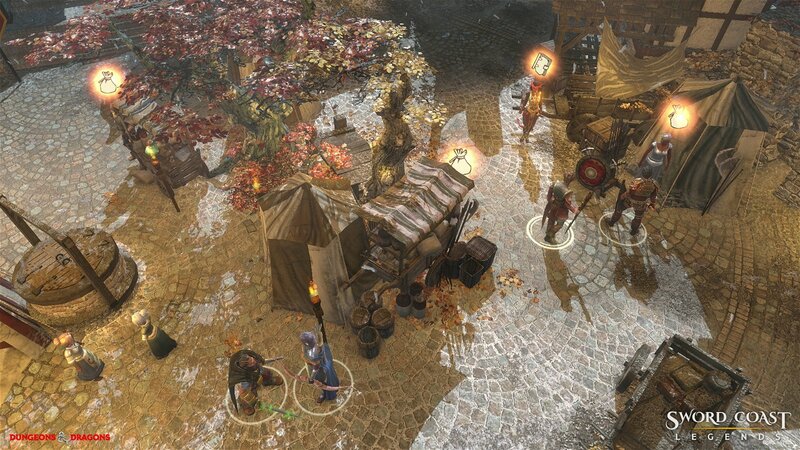 And though its underlying ideas are exciting, Sword Coast Legends entirely fails to capture the magic of a social role-playing experience. 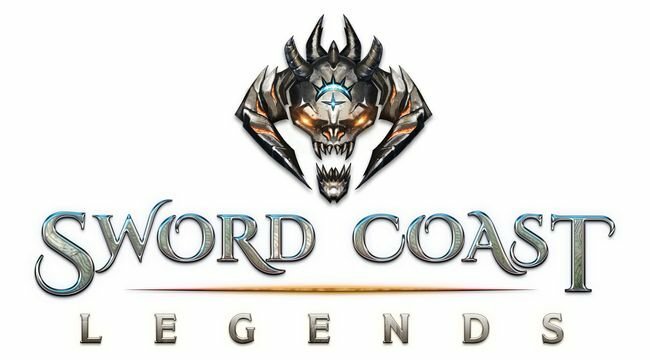 Giving players the ability to tell their own stories is a lofty goal, and if Sword Coast Legends is trying to lead by example, it doesn’t do a very good job. The main story campaign that accompanies the game is, at best, a jovial yet boring romp through a universe that has become derivative and underwhelming. 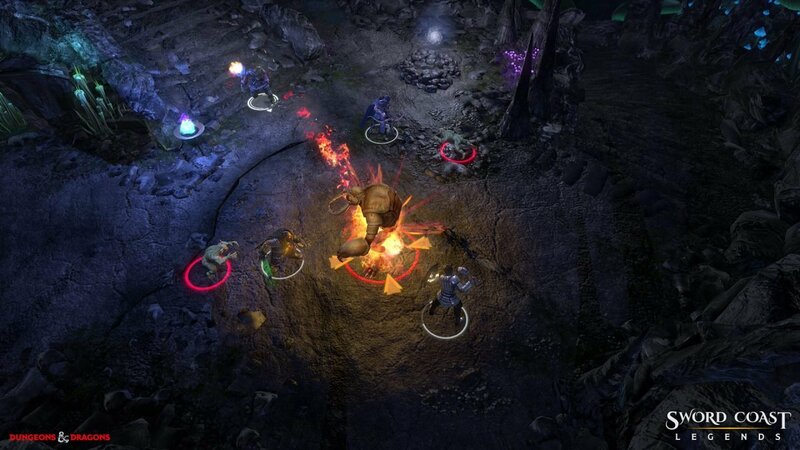 While I absolutely believe that Dungeons & Dragons has more than enough new frontiers to explore from a narrative perspective, Sword Coast Legends does very little of interest with the source material it is based on. 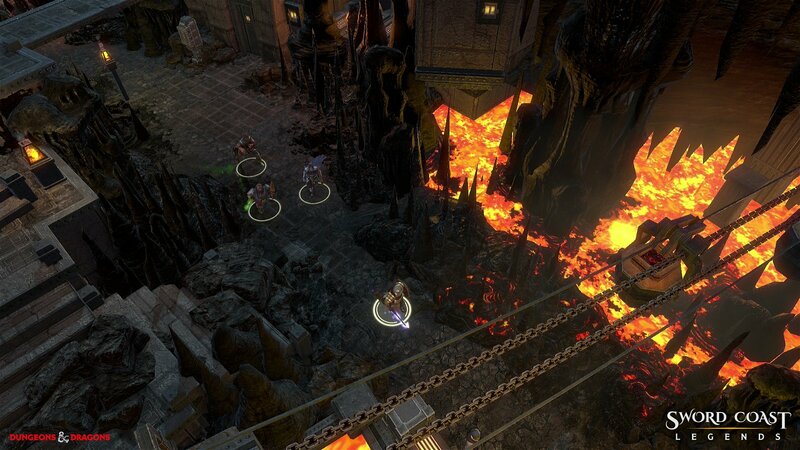 Sword Coast Legends takes place in the same stretch of coastal terrain that has housed some of Dungeons & Dragons’ greatest stories, yet fails to tell a tale that can even hold a candle to these classics. If you come to Sword Coast Legends expecting characterizations on par with Baldur’s Gate II, you’ll be sorely disappointed. Branching quests often lead towards the same end, and dialogue choices were mostly used to fill in the blanks of the story rather than open up new avenues with your friends and enemies. Even the fact that companions you choose to leave behind at camp can still speak to you through a ‘speaking stone’ feels like a thin contrivance. They’ll always be there to weigh in on the events of the story, so leaving them behind doesn’t have any consequences to speak of. That isn’t to mention how silly it is that, for whatever arbitrary reason, you can only have four characters in your party while the rest are resigned to sit behind and camp and make jokes through the speaking stone. Why can’t they just come along? The story itself is terribly cliché. You’ll kick things off with a series of nightmare sequences that spell doom and gloom for the world. Early quests are so poorly realized that I rolled my eyes more than once at just how plainly generic they were. Few ever aspire to do more than require you to kill a certain number of monsters or collect some item from an out of the way cave. Once the story gets going though, I found I was becoming more engaged with it over time, and there were certain characters and moments that helped break up the monotony of clichéd moments strung together one after the other. All of this would be more palatable if the combat in Sword Coast Legends wasn’t wholly underwhelming. 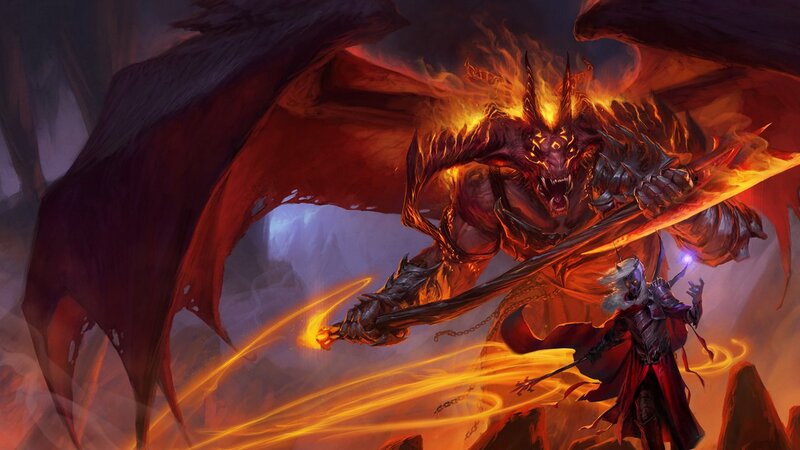 If you’re a fan of Dungeons & Dragons, turn back now; Sword Coast Legends bastardizes the 5th edition of D&D, cross-breeding it with the hotkey, cooldown driven ability system present in most MMORPGs. New abilities are selected from a series of skill trees when a character levels up, and the traditional spell books are nowhere to be found. While the genre is often known for being highly strategic, Sword Coast Legends feels more like a chaotic mess. This is partly due to how terrible and unresponsive the user interface is, and partly due to the cooldowns on abilities being so long that you’ll frequently spend time just exchanging blows with monsters while you sit there waiting. It quickly got to the point where I refused to actively participate in combat as much as possible, instead letting the lacklustre AI make choices on my behalf. The fact that combat is so dull really drags down the user-created content, too. A whole system is built into Sword Coast Legends that allows you to create your own campaigns with quests and monsters, but the depth of the custom content is so shallow that everything ends up feeling the same. Aside from writing narrative text to various aspects of your custom campaign, actual storytelling options are so limited that each module I played felt the same. Designing a dungeon merely requires picking set rooms from a basic pool of choices, meaning every dungeon has a familiar feel after a while. Designing monster encounters can be a bit more interesting, but even then, you have no ability to change how any monster or computer-controlled character reacts, meaning you simply choose your monsters and let the computer do the rest. As someone hoping to jump in and create an epic campaign for my friends to play, I was incredibly disappointed with how narrow and shallow the tools were. 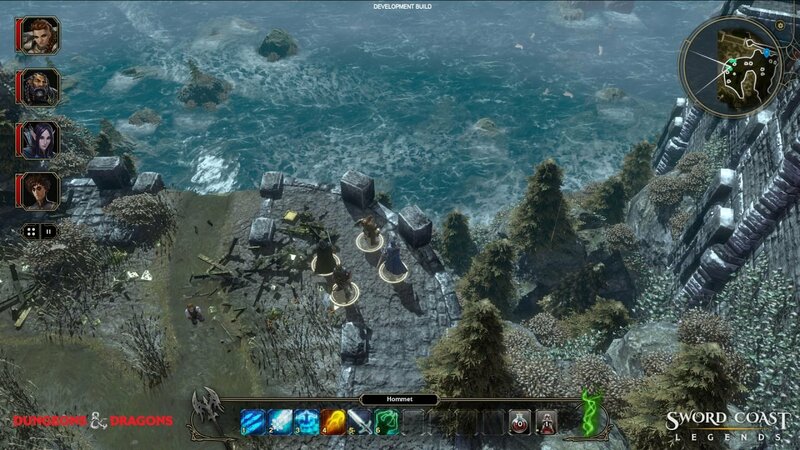 Sword Coast Legends is so disappointing because it clearly had a great idea at its core, but the execution of every single step is botched, leaving the final product this awkward jumble of poorly realized ambitions. Nothing is overtly terrible, aside from the clunky interface, but nothing is all that worthy of your time, either. You might as well un-crumple your character sheets and dig up your die, because the social aspect of RPGs isn’t going anywhere. Not with Sword Coast Legends, at least. While the genre is often known for being highly strategic, Sword Coast Legends feels more like a chaotic mess.